When grilling outside an outdoor grill table is almost an accessory you can not do without. You can use your grill side table but those are most of the time just not big enough and when using a table top grill there is not side table.. 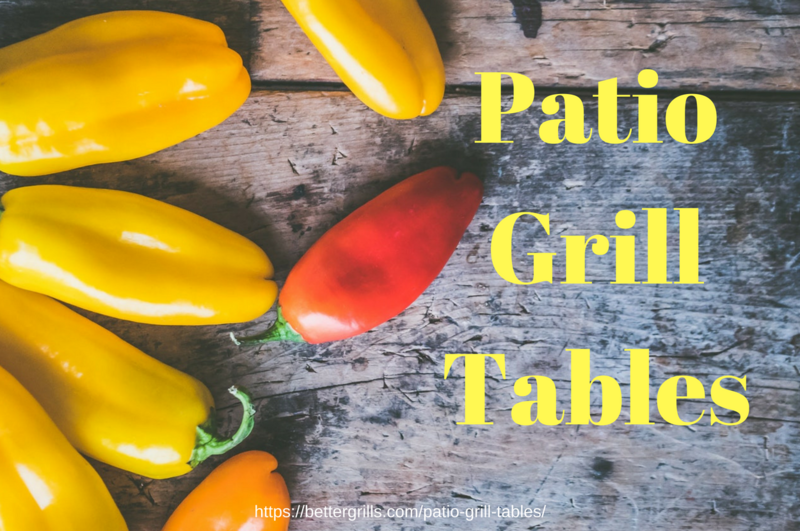 There are several types of grill table plans that we can use as an outdoor grill prep station, but we have to think about what we will use it for. A folding grill table is very easy to take with us to the campground as a portable grill table you can even use if for a pick-nick. There is no ultimate outdoor grilling table and you have to find the one that fits your needs the best. Some times all you need is extra room next to your smoker or grill to do some prepping. But maybe you need a lot more and are looking for an outdoor grill table to cut your meat and use for a lot more things. We have found a few of the highest rated outdoor grill prep tables for you to choose from. 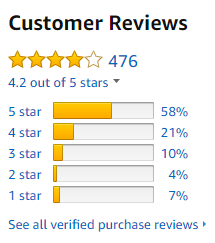 Over 470 customers that wrote about their experience with this outdoor prep station and left and average of 4.2 out of 5 stars. Upper compartment measures 15.5 inches wide, 17.5 inches deep and 10.5 inches high. The storage under the top can be used to store a lot of accessories we use all the time with your grilling. It is not advised to store food in their because the doors are not 100% sealed of course. I found a lot of people who mentioned that even in heavy rain nothing got wet inside this grill table. Many people mentioned how sturdy the construction is and how well it holds on. Someone mentioned he had it for a few year without any problems and still uses it very much. The manual mentions not to leave it out in the freezing temperatures since it can compromise the material. This is in my opinion something that is obvious for a lot of plastic products. The drop lead side table are easy to fold to make this barbecue table not take up too much space when not in use. Lower ratings mention it is hard to assemble and some parts came warped out of the box. 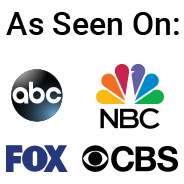 Higher ratings mention it to be very good and sturdy and many have used it for a long period of time. It can hold up a lot of weight and I read someone had over 20 pound on it with no problem. The 4 caster wheels work great and with 2 of them having the lock mechanism you can keep it in place with no problem. You can also remove them easy and this comes in handy if you are planning on keeping the Suncast table stationary. Just realize that the wheels are 2.5 inches in diameter and taking them of lowers the total height. This Keter XL outdoor grill and prep table can be used in and outdoors. It deserves the extra large in its name because it measures 53.1 inches long, 20 inches wide and 35.4 inches in height. This all together adds up to 78 gallon capacity. 54 gallon can be sealed and closed the rest is open space. Why they call this a charcoal table I don’t know. It is just as good for a portable gas grill. Weber is the company that build this table and we found over 150 buyers who wrote about their opinion of this Weber grill table, and their opinions are good enough to rate it with a 4.5 out of 5 star rating. We had a good look at them to see if it is worth those rating. We always first look at the lower rating because those are more important than the ratings from people who are totally satisfied with a product. There were two 1 star ratings and one of them mentioned that the legs were to hard to insert and remove and that is why they returned it and the second mentioned it does only fit table top grills made after 2013. Got no idea what the difference is, but that is what they wrote. No two star ratings and the one of the 3 stars wrote it fitted his Jumbo Joe Gold Charcoal Grill from Weber perfect, except that there is not much room left on the table. Okay lets move on to the 4 and 5 star ratings and see what they have to say. I see that is is a great fit for the Weber G0-anywhere grills and it get some good remarks for it light weight. Someone however mentioned that the light weight of this frill table took away from the sturdiness and the overall quality. A portable BBQ table will need some compromising to be light-weighted enough for camping and transportation of course. Overall this outdoor BBQ table table is worth the ratings it received and can be considered a good buy. The price is a little steep, but Weber is a good brand although someone mentioned that the quality is not as high as it was in the past. Like any other company according to this reviewer. 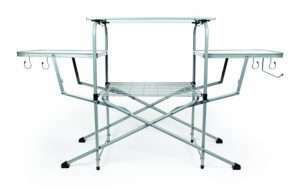 This Camco deluxe grilling table is real easy to setup and provides a lot of space with the two side tables. It comes in a handy storage bag with a carrying handle. The top table of this outdoor grill table is large enough to use for about any portable grill and the side tables can be used for dishes or anything else you need for grilling. There are 4 hooks for you utensils and a paper towel holder included. Lets start with the lower ratings although there were only a few of them. They stated that in the rain the shelves will warp and can not be used anymore. Someone mentioned it was hard to use if the ground surface was not level, but does not go for any table I asked myself. The table for the grill part is very good and made of aluminum and measures 16×26 inches. It is locked on the frame and that makes it even better. Folded the table measures 19x17x6 inch and set up it is 19x58x32 inches and it high enough even for slightly taller people and still on a height for most people to be able to look in the grill. Assembly is very easy and straight forward and can be done under a minute. folding up is just as easy and it fits great in the carrying case that comes with it. One thing we have to mention and that is that it seems to be very important to keep the side tables dry or dried of immediately after they get wet or they will warp. If you keep the table outside keep it covered when rain is in the forecast to prevent this warping. It is hard to give any advise on what size a outdoor grill table should be because it all depends on what you will use it for. If all you need is a place to set your meat before putting it on the grill maybe the side table that came with your multiple burner gas grill is large enough. If you are more into grilling a whole meal with vegetables and all the fixings you need a lot more space. 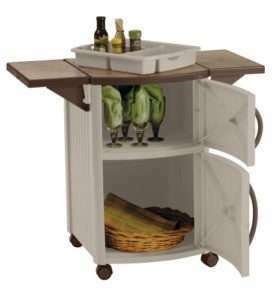 When you also need room to put your portable gas grill also a nice size table needs to be on your wish-list and yo should maybe think of one of the larger outdoor grill prep stations we reviewed. A outdoor BBQ prep table that you like to use on the campground or anywhere else best can be fold able and light weight. The smaller it is the better for traveling of course. A grill table for an RV should be easy to store and not weigh to much. 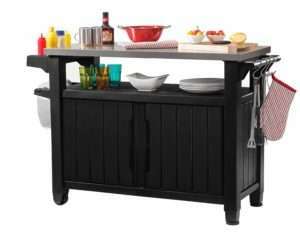 It is not just a prep table but also can be used as an outdoor grill stand to put your portable gas grill on it. If you however only use it at home as a BBQ prep table and have the option to store it in the garage or shed in the winter time you can go with a larger and more heavier table so you do not even have to use your outdoor grill stand maybe. I hope this review of outdoor grill prep tables helped you find the one that fits your backyard, patio or even camping and tailgating events.